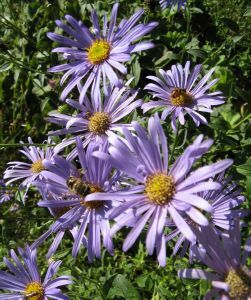 Aster frikartii ‘Monch’ is probably one of the top ten border plants, this traditional lavender-blue aster offers several advantages over other Michaelmas Daisies. It has a longer flowering season,beginning earlier, in mid-summer, and continuing into autumn. It doesn't really need staking, and is mildew-resistant. It is also exceptionally free flowering,with an attractive colour that is easy to place as it associates well with so many summer and autumn flowers. Asters are best grown in a sunny or partially shaded position with fertile, well-drained soil. It requires adequate moisture throughout summer. The Royal Horticultural Society has given it its Award of Garden Merit. For the purposes of definition, late summer flowering perennials may be described as plants that reliably produce flowers or that have as their main feature of interest (an architectural silhouette, or attractive seed heads for instance) which can positively contribute to the garden after midsummer's day on a year in year out basis. There is little doubt that the climate is changing,for whatever reason, and that seasons are not as distinct. In Britain the autumn season is lengthening and often there is relatively frost free weather up until December. The majority of gardens in Britain look at their finest in the spring and early summer, leaving many gardens looking relatively lacklustre after June has passed. The use of these late summer flowering perennials in the garden should renew inspiration in the months of the year when the shadows are lengthening.